I had a really lovely afternoon today at UCLA's Billy Wilder Theater. 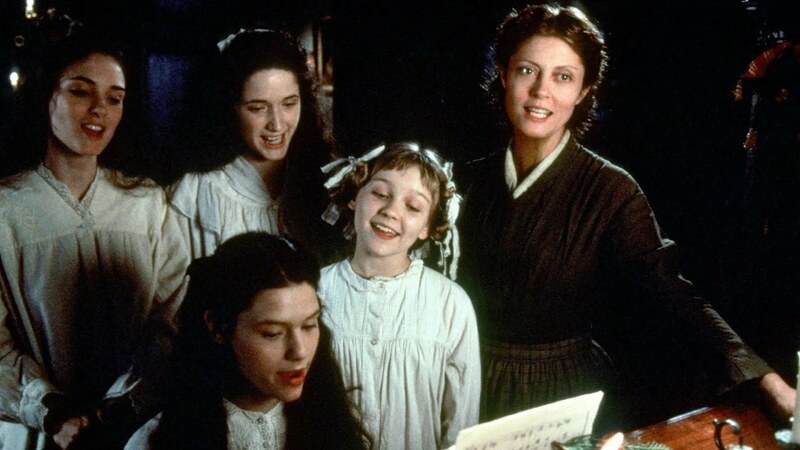 The four-film series Holidays in the Movies began today with a screening of a 4K digital restoration of the 1994 version of LITTLE WOMEN. 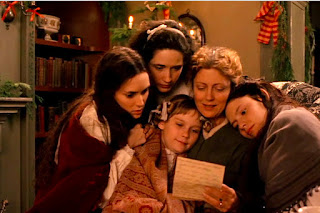 Louisa May Alcott's LITTLE WOMEN has been one of my favorite books since I was eight or so, and I have enjoyed multiple film versions many times over the years. My favorite has always been the 1933 RKO version with Katharine Hepburn as Jo, and I also very much like MGM's colorful 1949 version with June Allyson. A 1978 TV version with Greer Garson as Aunt March is another one I've enjoyed multiple times. 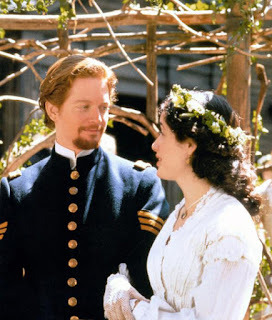 I saw the 1994 movie in a theater when it was first released, then again on DVD in the earliest days of this blog, back in 2005. I've always enjoyed this version, yet at the same time felt a certain reticence about it, due to the liberties it takes with the book, condensing situations (i.e., Beth receiving her piano from Mr. Laurence after her illness) and also having a somewhat "revisionist" feel, both in terms of feminism and a subtle emphasis on transcendentalism rather than Christianity. That said, seeing the film today felt like a wonderful rediscovery. My hesitations still stand, yet at the same time this is a film of surpassing beauty; if one accepts the filmmakers' vision separate and apart from the book, it couldn't be more perfect. Simply put, the film wrecked me, in the best possible way. I don't know when I've last cried like that at a movie! It was truly wonderful. 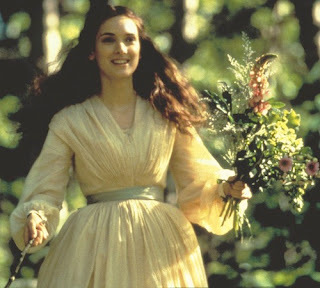 I'm sure most readers are at least somewhat familiar with the story, about Meg (Trini Alvarado), Jo (Winona Ryder), Beth (Claire Danes), and Amy (Kirsten Dunst, later Samantha Mathis) March growing up in Concord, Massachusetts during the Civil War. Although they live in straitened circumstances with their father (Matthew Walker) away at war, they are rich in imagination and in their love for one another. 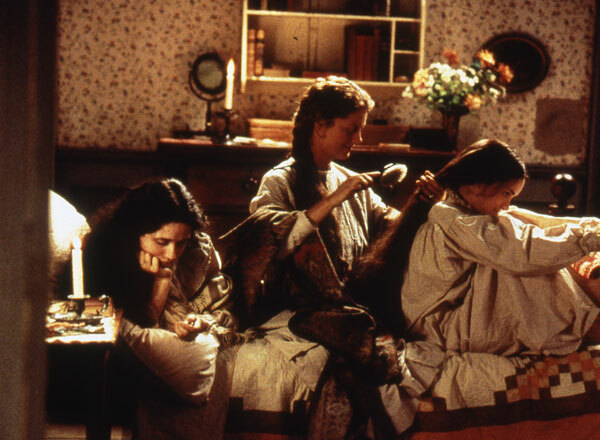 The girls are guided by their mother (Susan Sarandon), who emphasizes the development of their characters, and they put up with crochety Aunt March (Mary Wickes). Their best friend is the wealthy boy next door, Laurie (Christian Bale). 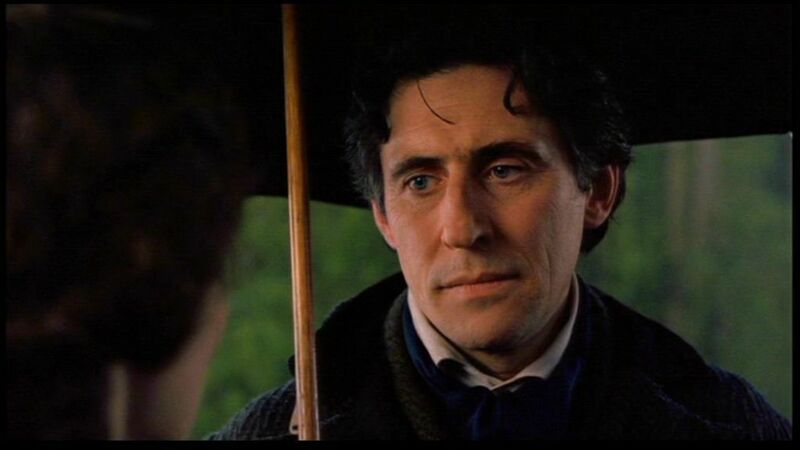 In time, Laurie's tutor John Brooke (Eric Stolz) falls in love with Meg, and Jo will meet an impoverished German professor (Gabriel Byrne). The movie at times is almost more a series of vignettes, touching briefly on various well-remembered scenes from the book, sometimes choosing to emphasize different moments than the prior film versions. One of the greatest things about the film is its sense of place and mood. As I wrote back in 2005, this is really the only film version which conveys what it must have actually been like living in an uninsulated house during the winter in 1800s Massachusetts. The candlelight scenes are beautiful while also realistically conveying just how dim it could be with only that for light. (I also couldn't help thinking of fire danger, especially with several kittens running around!) Having had the good fortune to visit Orchard House, I love how much of the interior was copied by the set designer. The film also captures that curious (to a Southern Californian, at least) dim light one finds in New England on a winter day. One of the things I remember about my visits to the area is how the light sometimes just looks a little different up there during the daytime, a little more gray, and photographer Geoffrey Simpson nails it. LITTLE WOMEN runs 115 minutes. It was written by Robin Swicord and directed by Gillian Armstrong. The perfect score, one of the best in recent decades in my estimation, is by Thomas Newman. 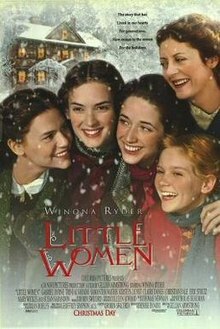 LITTLE WOMEN is available on DVD, Blu-ray, and VHS. It can also be rented for streaming at Amazon. The movie was introduced by Jeremy Arnold (seen at right), who signed his new book CHRISTMAS IN THE MOVIES before the screening. He shared that this film is one of his favorites in the book. I was fascinated to learn that Katharine Hepburn had been offered the role of Aunt March, but turned it down, feeling she could never compete with the job Edna May Oliver had done in 1933. It's also rather delightful that, as Jeremy pointed out, Mary Wickes is known for two classic Christmas movies, THE MAN WHO CAME TO DINNER (1942) and WHITE CHRISTMAS (1954); this was her last feature film, and it has a pair of beautiful Christmas sequences. Jeremy is introducing Christmas films with Ben Mankiewicz on Turner Classic Movies this weekend. 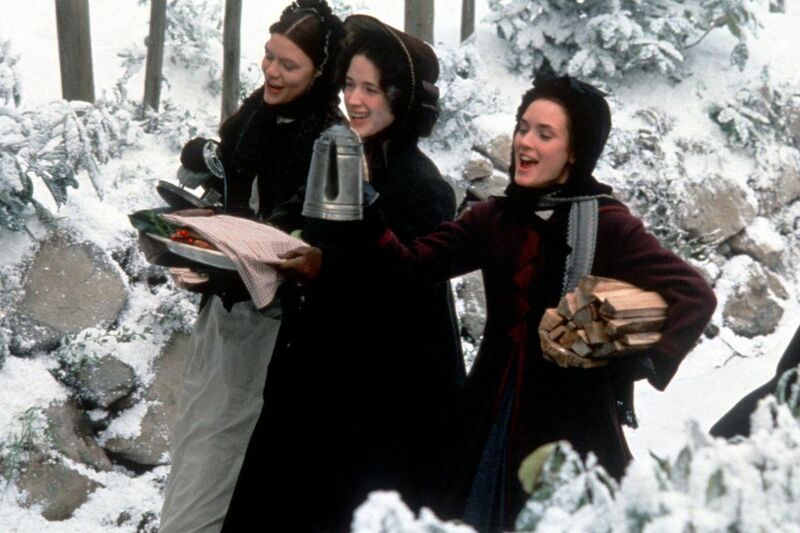 Later in the month, LITTLE WOMEN (1994) will have its TCM premiere on December 16th, taking its place in the network's Christmas movie lineup alongside the 1933 and 1949 versions. I quite love this movie -- it came out when I was 14, and I got to see it on VHS about a year later. My friends and I watched it repeatedly, both in high school and college. I recently introduced it to my kids, and they liked it fairly well, but I think they need to grow into it. I'll get to see it on the big screen for the first time later this month, and I can't wait! The last time I read the book, 2 or 3 years ago, I noticed that it actually contains a great deal of Trancendentalism too, much more than I'd ever noticed when I was young. The movie plays it up some... but not much, actually. Thank you Laura for your review of Little Women!!! 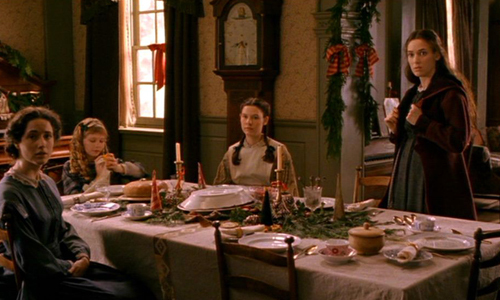 BTW, PBS recently did their version of Little Women this year with Emily Watson and Angela Lansbury!! Have you seen the film and what are you thoughts about it? Hamlette, what I nice memory you have of this film. I'm glad you were able to share it with your own children -- and how exciting you will also have the opportunity to see it on a big screen! I've read the book countless times (can even recite the first few lines from memory!) but it's been a very long time since my last reading. I wonder what new discoveries I'd make? Lady American, thanks for your note! I have a DVD set of the PBS version of LITTLE WOMEN you reference but have not yet had time to watch it. I enjoy seeing different takes on this favorite story and look forward to it -- if you saw it, did you enjoy it? I understand there's yet another version coming out next year with Saoirse Ronan as Jo.